Can you imagine having dead spots in your home wireless network, when there’s a top-rated Wi-Fi range extender available on Amazon for just $19.99 that’ll fix your problem in a matter of seconds? No, of course you can’t. 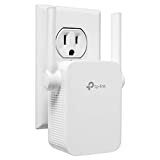 But just in case, you should know that the TP-Link N300 WiFi Range Extender is currently discounted on Amazon, so it’ll only cost you $22 to dramatically improve your Wi-Fi network and do away with any dead spots for good.